Every woman is different. And that’s never more clear than when a man decides to marry her. Some women have been planning their wedding since they knew what the word “wedding” meant. Others don’t even think about it until they meet the guy they want to share their lives with. How else do they vary? With the engagement ring. Contrary to popular opinion, a diamond engagement is not the only way to go. Nor is it always the best way to go. Sometimes, something different, like any of the following funky engagement rings, will be the best thing you can do. Diamonds may be a girl’s best friend, but that doesn’t mean every girl wants a diamond engagement ring. Even women who do want a diamond might not be interested in the traditional solitaire or tri-stone settings that are often found at many jewelry stores. And that is okay. Engagement rings should be an expression of love for the individual who will be wearing it for the rest of her life. It should also represent commitment to her. And sometimes, that includes some funky choices. Many of these also come in a variety of colors and can be paired with different stones. So, if it’s important to you that your girl has a diamond, you can include her favorite stone and include a small diamond. Or you can include a combination of your and her birthstone with a diamond or her favorite stone. Most engagement rings are pretty simple: a single diamond, three diamonds with the one in the center bigger than the other two, or a slightly larger center diamond surrounded by smaller diamonds that wrap around or halfway around the ring. Or some variation thereof. Boring! For the more adventurous, there are plenty of other options. For instance, the “tension” band loops around, but never connects. The diamond is the only thing connecting the two bands. 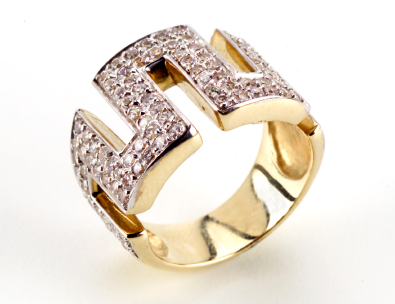 Some thicker bands have small diamonds scattered around it, within the ring, in various patterns. Others look like two rings that loop, just a small distance apart from one another, connecting at the diamond and at the side opposite the diamond, overlapping slightly at those points, but going in other directions at all other times. As you may know, each stone has its ideal cut: pear, round, square, princess, etc. These stones can all be used to shape a ring into another shape, such as a heart, a teardrop or a tulip. Engagement rings offer the perfect opportunity to express a unique sentiment or represent something that is close to the future-owner’s heart. And by using a variety of colored stones, it’s easy to create a look that’s unique and original. For instance, some girls might love to have an engagement ring with stones shaped into a peace sign, the “om” sign or into a flower with pink petals and delicate, green leaves. Funky engagement rings can also include antique rings. These are different than what are worn today and may have a history behind them that is special to the couple. Or they may simple have a style that is admired by the bride-to-be. Want another option? Tattoos. For women who don’t mind needles, a tattooed engagement ring could be the perfect option. This funky look can be designed as anything she wants – and will serve as a permanent reminder of you and your commitment to one another. This option, though open to anyone, could be perfect for women in the military who might not be able to wear engagement or wedding rings because of military regulations. The most important step when it comes to choosing an engagement ring is making sure your girl likes it. There are three ways to do that: 1) bring her along 2) talk to her or 3) talk to her best friend. Choosing an engagement ring is a very personal step. If you’re going to make sure you do it right and that she’ll love it, want to wear it and think of you every time she looks at it. This is triply important when you’re getting a funky engagement ring, because each girl’s taste is going to be different. The ring that’s perfect for one woman won’t be anywhere near passable for another. Funky engagement rings also tend to cost more than traditional rings because they have unique stones and settings that are less likely to be resold if something happens. The cost of funky engagement rings varies as much as the cost as any other engagement ring. However, the intricacy of the ring and the number of stones in it, the shape and exactly how unique it is are all factors that could play a role in cost. However, the main things that play a factor in the cost of any gemstone are the clarity, cut, carat and color, typically known as the “Four C’s”. This means that, usually, the bigger the stone, the more it costs. For diamonds, the clearer the stone (yellow is bad) the more it costs. If the stone has bubbles in it, it will cost less than a stone that has no or few imperfections. And, if a stone was cut in the best way possible for it, it will also cost more. Rubies, for instance, vary in shades of pink to nearly black. In most cases, with rubies, the darker the stone, the more it costs, but it must always be red, or it’s a sapphire. The most expensive-colored ruby is called pigeon-blood red. Another things that can affect the cost of an engagement ring is is the value of the gemstone. Diamonds are expensive: the average diamond runs from $1,000 to $3,000 in cost. And that’s just for one stone. Other stones vary dramatically depending on the above-mentioned four C’s and the demand for the stone. For instance, emeralds and aquamarines are valued rather less than rubies or diamonds, so they cost less. The good news about funky engagement rings is you can often create your own. With the help of a jeweler, you can select stones that best fit the look you’re trying to achieve that also fit your budget. If you’re looking into the tattoo ring option, most tattoo parlors (select one that’s clean and reputable) will do. However, if you’re going for a ring that will slide on and off (for awhile, at least), you’re going to need to go to the jeweler. Depending on where you go and what you want, you may need to search for awhile. Many big-named jewelers may have less in the way of unusual designs, especially if you’re not looking for a diamond. Department stores jewelers are also more likely to use synthetic stones that are less valuable. But small, local jewelers may be more willing to work with you. However, either way, jewelers want to make a sale, so most places will be fairly willing to take your ideas into consideration and will tell you straight out what they can and cannot do. They should also be able to give you some price ranges so that you can decide whether what you’re looking for is something that fits your budget. As you propose to the woman you love, do so with the confidence inspired not only by having an amazing engagement ring that you know she will love because you know her, but knowing that she’s what you want. Remember the purpose behind the ring – commitment, shared love and a future of shared experiences – when you pop the question.